Genuine OEM Canon 1491A002AA, E31, E40 Black Copier Toner. They are designed to work in the Canon FC-200 printer/copier(s). Genuine OEM Canon 1492A002AA, E20 Black Toner Printer Cartridge. 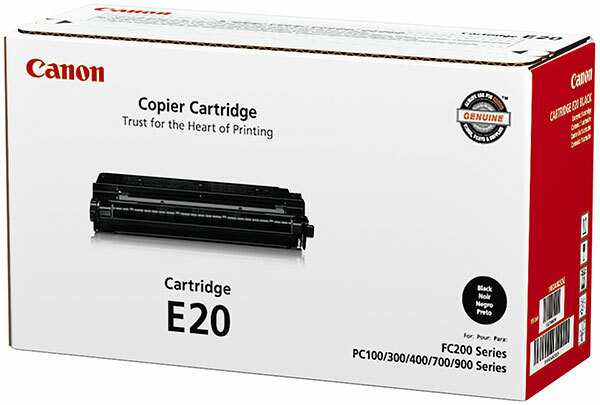 They are designed to work in the Canon FC-200 printer/copier(s). Premium Quality 1491A002AA Black Copier Toner compatible with the Canon FC-200. The use of compatible supplies does not void your printer warranty. Premium Quality F41-8801-750 Black Copier Toner compatible with the Canon PC 300, 310, 320, 330, 400, 420, 430, 530, 550, 710, 720, 730, 740, 770, 790, 920, 940, 950, 980. The use of compatible supplies does not void your printer warranty.